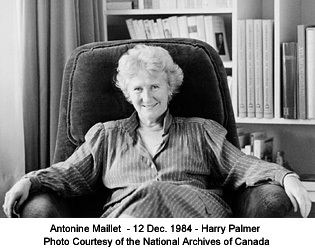 Antonine Maillet – novelist and playwright – is the foremost voice in literature from the French-speaking Acadian East Coast of Canada. Her hometown of Bouctouche (pronounced buck-toosh), New Brunswick, boasts "Le Pays de La Sagouine," a tourist theme park based on Maillet’s award-winning La Sagouine (1971). La Sagouine, by Antonine Maillet, is a series of dramatic monologues that broke new ground in Canadian theatre and was performed internationally. Upon publication, it sold over 100 000 copies. The title character, an old Acadian washerwoman, embodies Acadian language and culture. The theme park, which celebrates the uniqueness of the Acadian dialect, culture and history, brings tens of thousands of visitors annually to a tiny town of less than 3000. Since the success of La Sagouine Maillet has published over thirty titles. A prolific and important Canadian, her work focuses on Acadian experiences both contemporary and historical and is written in Acadian dialect, which, largely unintelligible to most Francophone ears, is based on language patterns from ancient France. The historic event of le Grand Dérangement is monumental in Maillet’s work. In 1755, as an outcome of power struggles between the colonial powers of France, England and New England, all of whom were vying for control of Canada’s fertile east coast, thousands of French-speaking Acadians were herded onto transport ships in Nova Scotia by the British Navy and forced to relocate to other British colonies such as Boston and Pennsylvania while their farms were torched. Some were sent across the Atlantic to France. Many died during the journey and many survivors were separated permanently from their families. The socio-cultural effects of le Grand Dérangement were, for the Acadian people, cataclysmic. "I have avenged my ancestors," said Antonine Maillet upon accepting the Prix Goncourt for her book Pélagie-la-Charette (1979) that chronicles the expulsion of the Acadians from Nova Scotia. The prestigious award is France’s highest literary honour for French literature and Maillet was the first North-American to ever win it. Maillet earned a B.A. and an M.A. from the Université de Moncton where she wrote a thesis titled "La femme et l’enfant dans l’oeuvre de Gabrielle Roy." In 1970 she received her Ph.D. in literature from the Université Laval. Her dissertation, Rabelais et les traditions populaires en Acadie was published by Presses de l’Université Laval. It catalogues more than 500 archaic phrases and figures of speech from 16th century French that are in common usage in Acadian communities today. Maillet has since been awarded more than twenty honorary doctorates. Maillet’s 1972 book, Don L’Orignal, won the Governor General’s Award. It is a magic-realist fable about love and war in Acadia. Maillet is a Companion of the Order of Canada, an Officier des Arts et des Lettres de France, a member of the Queen’s Privy Council for Canada and a 2005 inductee into the Order of New Brunswick.